We’ve been putting up a lot of videos lately but this is one of our favorites. At the risk of annoying Shnider’s wife, try calling him on the number he lists and see if he answers! 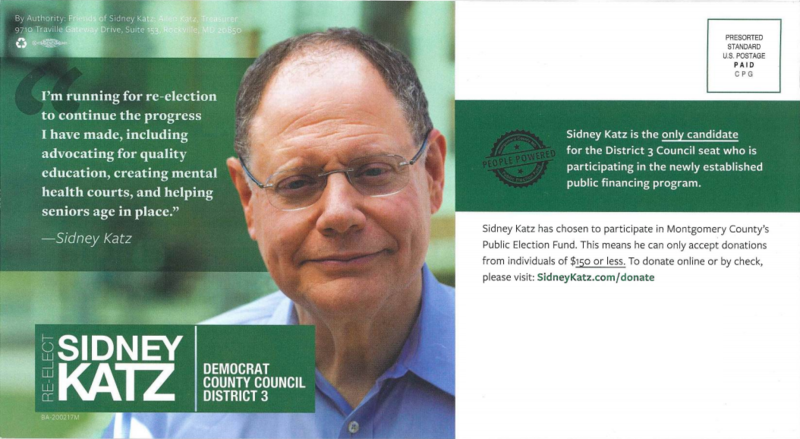 Mailhouses rejoice as Council District 3 rivals Sidney Katz and Ben Shnider have chosen to exchange early mailers in an increasingly active race. We’ll have more to say about this primary soon. Montgomery County Council District 3 candidate Ben Shnider has been endorsed by Delegates Shane Robinson (D-39), Andrew Platt (D-17) and the leader of a hotel employees local union. Former Council Member Valerie Ervin (D-5) has also offered praise for Shnider’s candidacy. We reprint Shnider’s press release below. 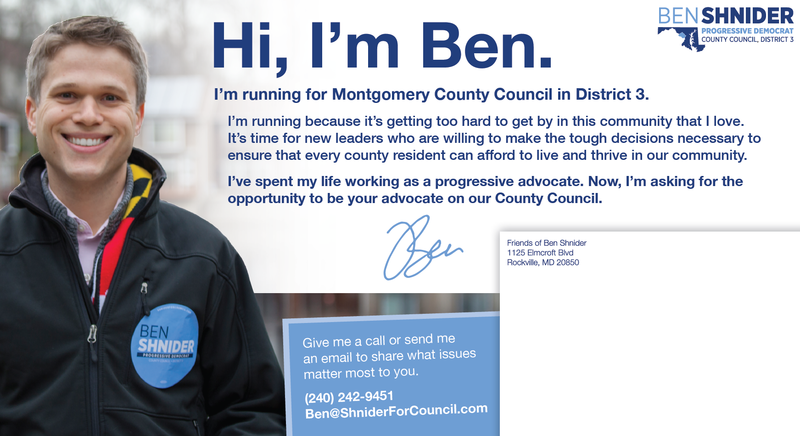 Rockville, MD – On Saturday, Sept. 16 at 1 PM, Ben Shnider’s campaign for Montgomery County Council will host a canvass kick-off event at the Lincoln Park Community Center in Rockville. Among those in attendance will be several notable community leaders who are endorsing Shnider’s campaign for progressive change in District 3. 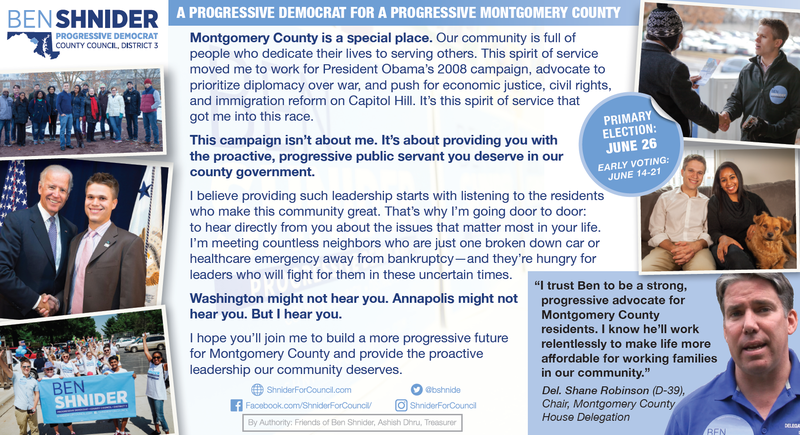 Ben Shnider is a civic activist running to represent District 3 on the Montgomery County Council. He’s running to ensure that all families can afford to live and thrive in our community. Ben has dedicated his life to fighting for progressive values. Prior to running, he worked as an organizer for then-Senator Barack Obama’s historic 2008 Presidential campaign, launched the political arm of the advocacy organization Bend the Arc, and served as Political Director for the pro-diplomacy group J Street. Ben is a former Board Member for the Montgomery County Action Committee for Transit and serves as Vice Chair of Rockville’s Human Rights Commission. To drive along Montgomery County’s I-270 corridor is to pass countless “For Lease” signs in front of near-vacant office parks. And to speak with service industry workers along this corridor is to encounter our community’s widening gap between the top 1% and other 99% — for whom it’s becoming harder and harder to afford living in the County. How we address these twin challenges of affordability and economic development will define our community over the next decade. Thankfully, by proactively seizing every opportunity to prioritize smart growth, we can make significant progress on both fronts. Consider the recent foreclosure sale of Lakeforest Mall in Gaithersburg. The mall was purchased for one-fifth of what the previous owner spent to acquire it in 2012. This drop in value coincided with, among other factors, the growth of the more walkable Crown Farm neighborhood about four miles down the road. The County is already studying a modernization of the well-used Ride-On transit center adjacent to Lakeforest Mall. A comprehensive mixed-use redevelopment of the property would complement this investment far better than retaining the dated mall by boosting foot traffic and economic activity. After all, the numbers are clear: walkable, transit-oriented areas in our region produce 80% more in retail sales than their auto-centric counterparts. And it’s these more walkable, transit-oriented neighborhoods that have recently drawn many regional employers. Mixed-use redevelopment of properties like Lakeforest can also be an important tool in addressing the affordable housing crisis in Montgomery County. Over one-third of County residents now rent and half of those renters are cost-burdened. Those looking to buy are often forced to choose between inadequate options that squeeze prospective buyers for unnecessary space and/or acreage. Walkable and transit accessible communities provide an opportunity for a broader range of housing choices. They also provide additional opportunities for existing affordability initiatives like the County’s Moderately Priced-Dwelling Units (MPDU) — a program that Gaithersburg and Rockville have also adopted. Of course, there are challenges involved when re-envisioning underutilized properties like Lakeforest, including adequate public infrastructure, individual property owners in need of an incentive to relocate, and developers who don’t want to contribute their fair share for infrastructure improvements. In this case, the City of Gaithersburg — a leader in smart growth — has wrestled with these hurdles for some time. And, of course, not every mall in the region is failing. For instance, Westfield’s Bethesda and Wheaton malls are doing relatively well. But these challenges can’t be an excuse for running on autopilot and the fact that some indoor shopping malls are doing better than others shouldn’t distract us from the overall trend. Instead, we must embrace opportunities to reinvent dated properties in the County with a sense of urgency. Otherwise our economy will fall behind those of neighboring jurisdictions, our residents will lack adequate housing and employment opportunities, and our government will lack the tax revenue necessary for critical investments like pre-K and enhanced access to Montgomery College. The County, therefore, must work with our municipalities and the business community to leverage every tool at its disposal to move away from shopping malls and cavernous office parks and toward more sustainable and affordable communities — from master plans and zoning text amendments (outside of cities, like Gaithersburg and Rockville, that have their own zoning ordinances), to reinvigorated and innovative economic development and affordable housing policies. This overall approach will help uproot the “For Lease” signs along I-270 while extending more economic opportunities to the low-wage workers working in their shadows. 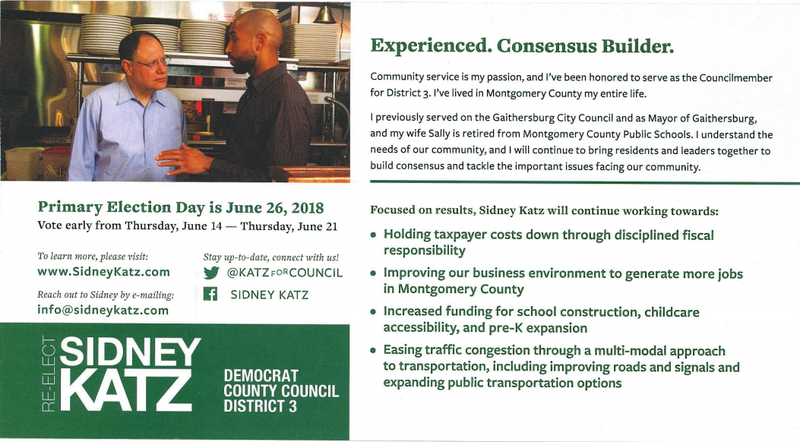 Ben Shnider is a Democrat who is running for Montgomery County Council in District 3.